Word, PowerPoint and Excel 2016 now make it easy for you to control the color of your content without having to figure out where those features are. Using the "Tell Me" box on the Ribbon you can set font color, shading, page color and more. Setting a color in the Tell Me box is as easy as clicking in the "Tell me what you want to do" box on the Ribbon and telling Office what you want to change and what color to make it. 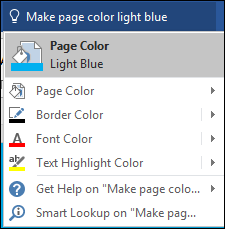 For example: "Make my font blue" or "Set the page color yellow". Tip: For most of these commands "make" or "set" work interchangeably. The tool is designed to respond to natural language. The following table lists the available commands and gives examples on how to use them. Note that the commands may vary depending on the language/region you have Office configured for. Sets the selected text to the specified color. If no text is selected this will turn on the color you specify for any text you type at the current cursor location. "Make font red" or "Set the font to purple"
Adds or changes highlighting on the selected text. Adds or changes the shading color on the selected item. Sets or changes the background color of the entire page. Sets or changes the color of the border around the selected shape. Sets or changes the background color of the selected shape. "Make my shape fill orange"
Supported colors include: Red, Yellow, Blue, Green, Orange, Dark Red, Light Green, Bright Green, Light Blue, Dark Blue, Black, White, Gray, Turquoise, Pink, Teal, Violet, and Purple. You don't have to use complete sentences if you prefer to be brief. "Font red" works too. If you want to clear highlighting from some text you can use "Highlight off". Note: Be sure to use "Highlight" and not "Highlighter" when setting highlight colors. The difference between shading and highlighting is subtle. Highlighting applies to text, but shading is a background color that can apply to the entire paragraph and make the paragraph appear to be contained in a colored box. You can set the shading for the entire paragraph by clicking anywhere in the paragraph and using "Make paragraph shading light blue"